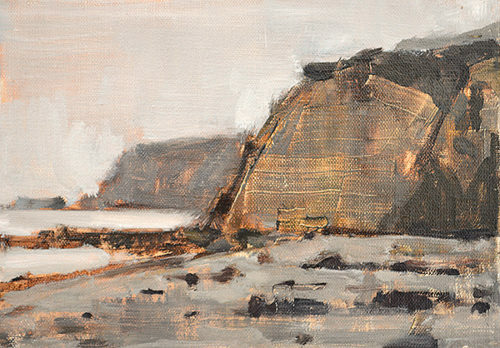 This entry was posted in Landscape Paintings, San Diego Paintings, Seascape Paintings and tagged 4 x 6 inches, blacks beach, california, del mar, oil on linen on panel, san diego on March 30, 2015 by Kevin. 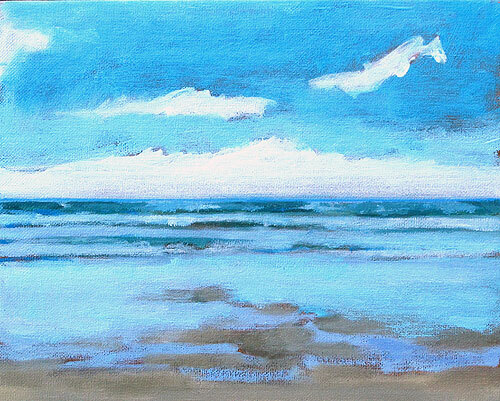 This entry was posted in Landscape Paintings, San Diego Paintings, Seascape Paintings and tagged 8 x 10 inches, beach painting, blacks beach, california, del mar, oil on linen on panel, san diego, seascape on October 16, 2014 by Kevin. 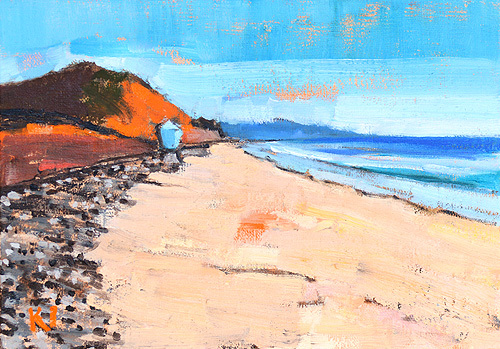 This entry was posted in Landscape Paintings, San Diego Paintings, Seascape Paintings and tagged 5 x 7 inches, beach painting, blacks beach, del mar, la jolla, oil on linen on panel, san diego, torrey pines on November 4, 2013 by Kevin. I’m not sure if this stretch is still Black’s Beach or not. At the bottom of the bluffs at Torrey Pines, in Del Mar. for sale. 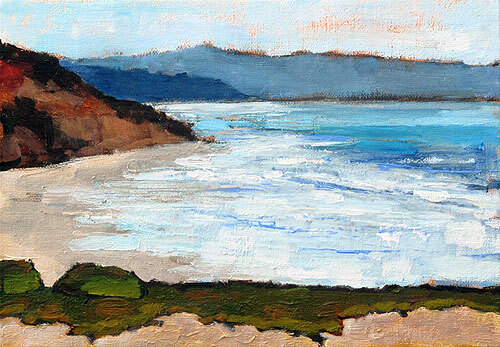 This entry was posted in Landscape Paintings, San Diego Paintings, Seascape Paintings and tagged 5 x 7 inches, beach painting, blacks beach, california, del mar, la jolla, ocean, oil on linen on panel, san diego, shore, torrey pines, water on October 2, 2013 by Kevin. Kelp washed up on Blacks Beach, San Diego. 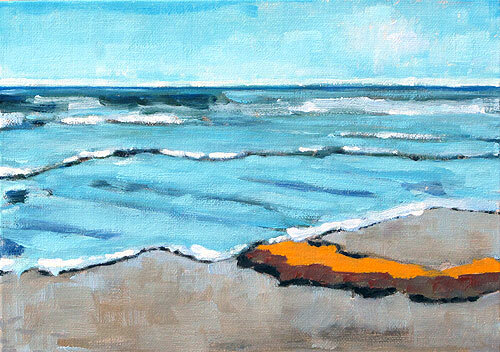 This entry was posted in Landscape Paintings, San Diego Paintings, Seascape Paintings and tagged 5 x 7 inches, beach, blacks beach, del mar, kelp, la jolla, landscape, oil on linen on panel, san diego on January 19, 2013 by Kevin. This is kind of a companion to yesterday’s Blacks Beach painting, both scenes looking out to sea, and painted at the same time. When I go to Blacks Beach, I try to do several paintings, since it’s at the bottom of these wonderful soaring cliffs and the stairs down to it are so killer. 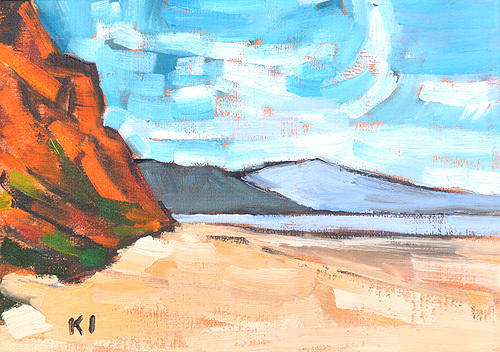 It’s a great place to paint, with every kind of light effect imaginable from the ethereal to the very stark. 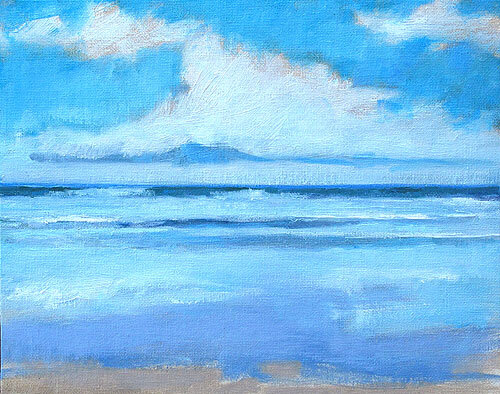 This entry was posted in Landscape Paintings, San Diego Paintings, Seascape Paintings and tagged 8 x 10 inches, beach, blacks beach, california, la jolla, ocean, oil on canvas board, san diego, sea, shore, water on December 28, 2012 by Kevin. I love the way the sky reflects in wave-wet sand. 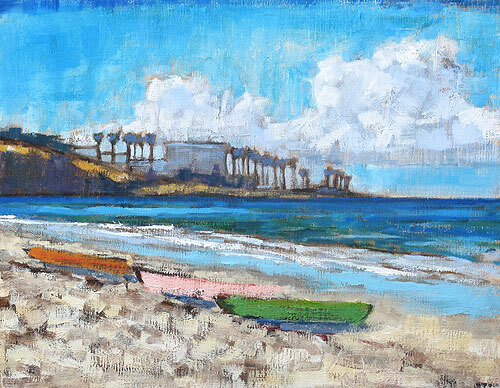 This entry was posted in Landscape Paintings, San Diego Paintings, Seascape Paintings and tagged 8 x 10 inches, blacks beach, california, la jolla, oil on canvas board, painting, san diego on December 27, 2012 by Kevin. Surfers, of course, sprint nimbly down the sheer cliffs. Personally, I use this twisting path- it leads from the Glider Port down to Black’s Beach. 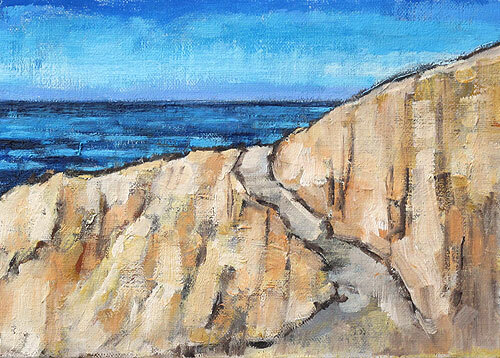 This entry was posted in Landscape Paintings, San Diego Paintings, Seascape Paintings and tagged 5 x 7 inches, blacks beach, california, cliffs, del mar, glider port, la jolla, ocean, oil on linen on panel, path, san diego, torrey pines on December 14, 2012 by Kevin. 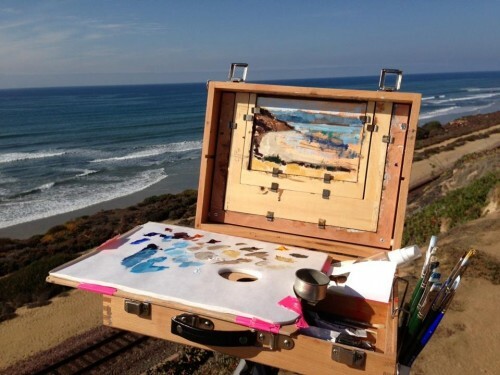 A plein air piece from the bluffs overlooking Torrey Pines Beach. 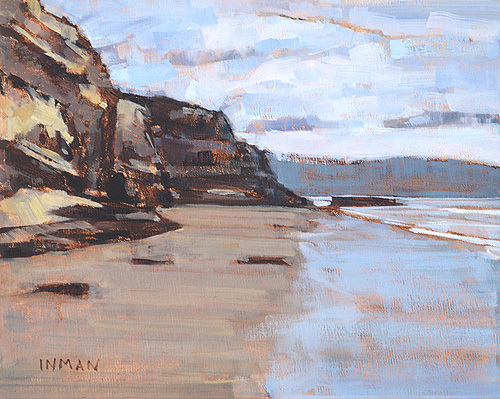 This entry was posted in Landscape Paintings, San Diego Paintings, Seascape Paintings and tagged 5 x 7 inches, beach, blacks beach, california, cliffs, del mar, ocean, oil on linen on panel, san diego, shore, torrey pines, water on December 12, 2012 by Kevin. Kayaks drawn up on the beach in La Jolla. This is such a tranquil spot. 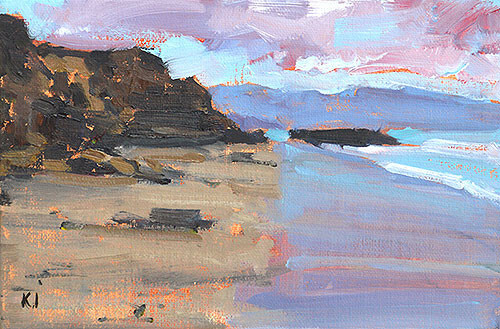 This entry was posted in San Diego Paintings, Seascape Paintings, Urban Landscapes and tagged 8 x 10 inches, beach, blacks beach, boats, kayaks, la jolla, la jolla cove, la jolla village, landscape painting, ocean, oil on linen on panel, san diego landscape, san diego painting, seascape painting, UCSD, university of california san diego, waves on November 30, 2012 by Kevin. Rolling surf seascape at Black’s Beach along the La Jolla, California coast. I love this beautiful area of the coast with its dramatic cliffs, wide beaches and hazy light; my knees love the stairs down to Blacks Beach somewhat less. 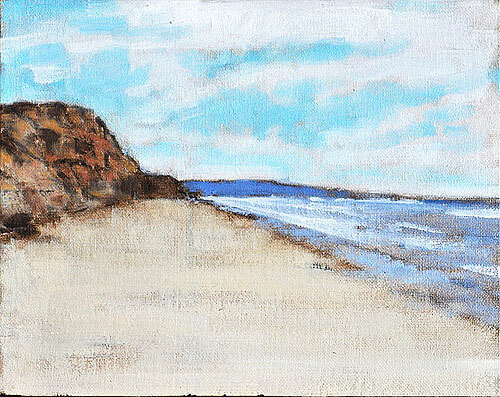 This entry was posted in Landscape Paintings, San Diego Paintings, Seascape Paintings and tagged $124, 8 x 10 inches, beach, blacks beach, california, del mar, la jolla, ocean, oil on canvas board, painting, san diego, torrey pines on November 19, 2012 by Kevin.